On this episode of Valley’s Gold, host Ryan Jacobsen goes to the birds! He starts the day at JS West in Livingston to see how this state-of-the-art facility does everything possible to keep their hens happy for the finest, freshest eggs possible. You can even watch the hens online here 24/7! Next, Ryan heads over to Pitman Family Farms to experience the incubation process of thousands of soon-to-be baby chicks and the measures taken to make certain newborns stay healthy on their way to the farm. 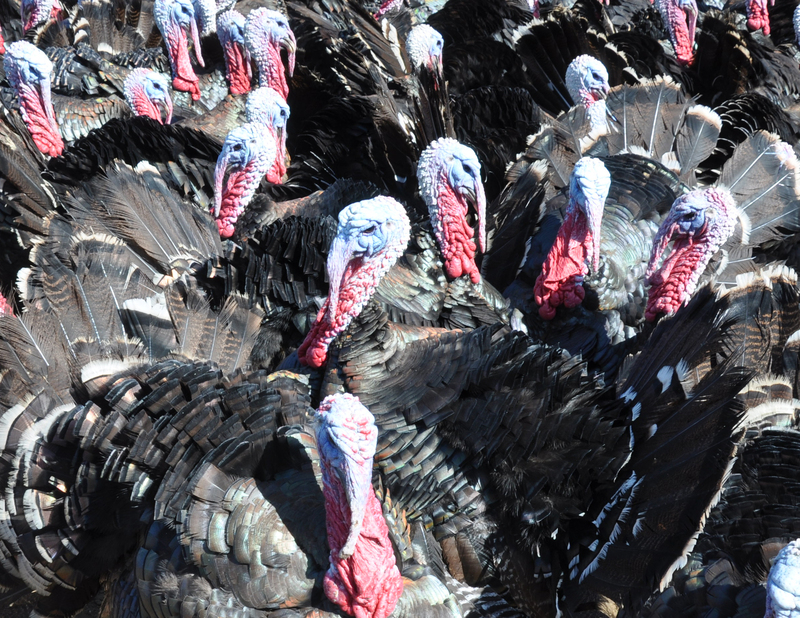 He then headed over to Orange Cove to tour, a free-range facility that features gorgeous and historical Heritage Turkeys-they even gobble together on cue! Finally, Ryan stops into the ValleyPBS kitchen with Jeromie Garza from The Painted Table to whip up some deviled eggs steeped in tea and to find out how to tell that your poultry is really cooked through. No matter how you crack it, this egg-cellent adventure is all a part of our Valley’s Gold. Each of the roughly 280 million laying birds in the U.S. produces from 250 to 300 eggs a year. In total, the U.S. produces about 75 billion eggs a year, about 10% of the world supply. About 60% of the eggs produced in the U.S. each year are used by consumers and about 9% are used by the foodservice industry. The rest are turned into egg products which are used mostly by foodservice operators to make restaurant meals and by food manufacturers to make foods such as mayonnaise and cake mixes. In addition to regular, generic eggs, most stores offer a variety of specialty eggs, including nutrient-enhanced, pasteurized, organic and vegetarian eggs. As a consumer choice, a small number of producers also sell eggs from hens raised cage-free or free-range. In modern henhouses, computers control the lighting, which triggers egg laying. Most eggs are laid between 7 and 11 a.m. A hen requires about 24 to 26 hours to produce an egg. After the egg is laid, the hen starts all over again about 30 minutes later. Egg size and grade are not related to one another. Size is determined by weight per dozen. Younger hens tend to lay smaller eggs. The size increases as the hen grows older and bigger. Grade refers to the quality of the shell, white and yolk and the size of the air cell. The white of a Large egg measures about 2 tablespoons’ worth of liquid, the yolk is about 1 tablespoon and the whole egg is about 3 tablespoons. Yolk color depends on the plant pigments in the hens’ feed. Natural yellow-orange substances, such as marigold petals, may be added to light-colored feed to enhance color. Artificial colors are not permitted. As an egg ages, the white becomes thinner, the yolk becomes flatter and the yolk membrane becomes weaker, making it more likely that the yolk may break inadvertently. These changes don’t have any great effect on the nutritional quality of the egg or its functional cooking properties in recipes. Appearance may be affected though. When poached or fried, the fresher the egg, the more it will hold its shape rather than spread out in the pan. On the other hand, if you hard-boil eggs that are at least a week old, you’ll find them easier to peel than fresher eggs. The eggshell accounts for about 9 to 12% of an egg’s total weight, depending on egg size. The hen uses about the same amount of calcium carbonate and other minerals to make a shell, no matter how big the egg, so the shells of smaller eggs are usually thicker and stronger than the shells of larger eggs. There are 7 to 17 thousand tiny pores on the shell surface, a greater number at the large end. As the egg ages, these tiny holes permit moisture and carbon dioxide to move out and air to move in to form the air cell. The egg can also absorb refrigerator odors through the pores, so always refrigerate eggs in their cartons. Eggs are enormously versatile. The chef’s hat, called a toque, is said to have a pleat for each of the many ways you can cook eggs. Beyond basic scrambled, fried, poached and baked eggs, you can cook eggs in the shell and turn them into omelets, frittatas, quiches and strata casseroles. In baking, eggs are used in cakes and cheesecakes, cookies, both stirred and baked custards, hard and soft meringues, pie fillings, soufflés and even pastries, such as cream puffs and eclairs. Although you can use any size egg for frying, scrambling, cooking in the shell or poaching, most recipes for baked items such as custards and cakes are based on the use of Large eggs. You can scramble, fry and poach eggs in the microwave. But you can’t cook an egg in its shell in the microwave. The steam builds up so rapidly that the egg can’t “exhale” it fast enough and the egg may explode.